Sifu Sonya Richardson has been training in the martial arts since 1990 and began practicing as a licensed physical therapist in 1988. She received her 3rd degree Black Belt in Kajukenbo, the Gaylord Method, under Professor Coleen Gragen and was promoted to 7th degree Black Belt by her current teacher Professor Barbara Bones. Sifu Sonya is also a 5th degree black belt in Kenpo Karate under Professor Gloria Boldizar. Her knowledge of biomechanics, combined with a positively-minded teaching style, provides a skillful and physically well-rounded learning experience for students of all levels and abilities. Classes are guaranteed to be challenging, gritty, and fun. Sifu Sonya has competed in national and international tournaments, consistently medaling in each for forms, weapons, sparring, and self defense divisions. 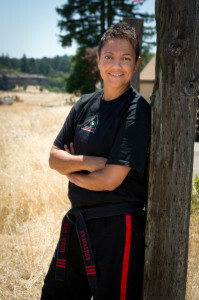 She teaches at three national martial arts camps: PAWMA (Pacific Association of Women Martial Artists), NWMAF (National Women’s Martial Arts Federation, and AWMAI (Association of Women Martial Arts Instructors), as well as local seminars for community martial arts schools and the Kajukenbo Association of America. She currently serves as the co-chair of the Anti-Racism Committee for NWMAF and President of the PAWMA Board. Sifu Sonya took on the role of Head Instructor of Hand To Hand in April 2007. Sifu Aarin began her martial arts training in 1984 studying White Crane Style Kung Fu under Sifu Ron Dong. In 1997 she discovered Hand To Hand Kajukenbo and began training under Sifu Coleen Gragen. Sifu Aarin received her black belt from Sifu Coleen in 2002, and her 2nd degree (2008), 3rd degree (2011), and 5th degree (2014) from Professor Barbara Bones. Sifu Aarin was part of the Hand To Hand team at the 1998 Gay Games in Amersterdam where she won a gold medal in forms and a silver medal in sparring. She was part of the Hand To Hand performance team and is a former Acting Head Instructor of Hand To Hand. Sifu Aarin continues to teach students of all levels. Outside of Hand To Hand, Sifu Aarin teaches kickboxing and hip hop dance. She also runs her own video production company, Aarin Burch Productions. Sifu Aarin was honored as the PAWMA Martial Artist of the Year in 2017. Sifu Joyce began her martial arts training at Hand to Hand Kajukenbo Self Defense Center in 1993 under Professor Coleen Gragen. As a white belt, she won a silver medal in sparring at the 1994 Gay Games. In 2009 Sifu Joyce was certified as a Self-Defense Instructor by the NWMAF (National Women’s Martial Arts Federation) and recertified in 2014. She served as a member of the Conference Coordinating Committee for NWMAF’s Self Defense Instructors’ Conference in 2009, 2011-2013 and on the Self-Defense Leadership Committee in 2014. Sifu Joyce taught NWMAF’s Empowerment Model Course at PAWMA (Pacific Association of Women Martial Artists) in 2015 and in 2018 at NWMAF’s Special Training. She was named PAWMA’s Martial Artist of the Year in 2016. In 2017 she joined NWMAF’s Self Defense Advisory Committee. She is a member of NWMAF, PAWMA, AWMAI, and a lifetime member of the Kajukenbo Association of America. She has served for many years as a Hand to Hand Board Member and is the Co-Director of Hand to Hand’s Self Defense Program. Sifu Christine Schoefer appreciates Kajukenbo for the physical conditioning, the mental discipline, and the spiritual awareness it builds. She began training in 1993 and has participated in Hand to Hand performances, martial arts camps, and Professor Coleen Gragen’s Black Belt Leadership classes. In 2000, Christine began studying Tai Chi and practicing meditation. She is Co-Director of Hand to Hand’s Self-Defense program and a NWMAF (National Women’s Martial Arts Federation) certified self-defense instructor. Her work includes curriculum development, mentoring, outreach, as well as teaching self-defense classes and workshops at Hand to Hand and throughout the Bay Area. Christine teaches the self-defense program at Mills College. Sifu Lorraine has been a student at Hand to Hand since 2000. She received her black belt from Head Instructors Sonya Richardson and Jen Resnick in April 2008 and was promoted to 2nd degree in 2010 and 3rd degree in 2014. A classroom teacher by profession and an avid dancer, she has discovered a love and talent for teaching physical movement to adults. She draws on her extensive knowledge of brain development and learning styles in designing and teaching martial arts classes that are engaging and challenging. As director of the New Students Program, Sifu Lorraine has developed a curriculum that provides a comprehensive introduction to Kajukenbo for people interested in exploring the benefits of regular Martial Arts practice. Sifu Lorraine can frequently be seen performing with her Hand to Hand sisters and brothers at martial arts and other community events. As part of her quest to develop a well-rounded physical and internal practice, she has also acquired a working knowledge of Chinese sports medicine and massage, and she practices Tai Chi and Qi Gong. 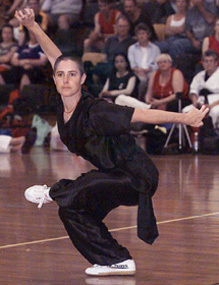 Chief Instructor Jen Resnick began training in the Chinese martial arts in 1983. In 1991, upon returning from training in China and Taiwan, she had the good fortune to discover Hand To Hand and Destiny Arts Center where she found a martial arts environment which also insisted that the warrior’s path be devoted to creating a just and peaceful self and society. She began training in Kajukenbo and soon after devoted herself to teaching at both Hand To Hand and Destiny Arts Center. Sifu Jen received her 1st Degree Black Belt from Professor Coleen Gragen in 1995 and was awarded her 6th Degree from Professor Barbara Bones. She is drawn to the eclecticism of Kajukenbo that allows each student to develop creatively and is grateful to have been blessed with a teacher who always encouraged her to expand herself into new ways of being in the world. She has competed nationally and internationally to great success. In addition to Kajukenbo she also trains in the arts of Shaolin Kung Fu, Tai Chi, Qi Gong, Ba Gua, and Xing Yi. She is a licensed acupuncturist and nationally certified herbalist in Traditional Chinese Medicine and practices Zheng Gu Tui Na, Martial Arts Therapeutic Massage, and Bonesetting. Sifu Jen became the Head Instructor of Hand To Hand in 2002 at the request of Professor Coleen Gragen. Since 2008, she has been living in New York, continuing her training in traditional Chinese Medicine and Internal Arts. Sifu Deborah began her martial arts training in late December of 1985 at Hand to Hand. She received her 1st degree black belt in 1993 and her 3rd degree in 2002 from Professor Coleen Gragen and received her 4th degree black belt in 2016 from Sifu Sonya Richardson. She has participated in many Hand to Hand performances over the years, from the early days of Gay Pride marches through more recent PAWMA camps. Sifu Deborah taught at Destiny Arts during its first few years as the children’s program at Hand to Hand. She was part of a women’s martial artist delegation to China in 2000. Over the years, she has complemented her Kajukenbo training with modern arnis, qi gong, and Chinese sword. Sifu Deborah’s long-time passion for the art of Kajukenbo stems from its groundedness, centeredness, playful ferocity, pure beauty, and structured practice. In the summer of 1998, Sifu Cynthia enrolled in Hand to Hand’s 10 week self-defense class, and in September of the same year she started the new beginner’s class under Sifu Jen Resnick. Sifu Cynthia received her black belt in March of 2009 from Head Instructors Sifu Sonya Richardson and Sifu Jen Resnick. Sifu Cynthia has participated in many Hand to Hand performances, as well as attended annual martial arts training camps where she continued to explore her power and centeredness. As a result, she began exploring her training in the Internal Arts (Taichi, QiGong and meditation). For more information on the founders and lineage of the Kajukenbo style we practice, please click here.